Manufacturer & Supplier of Core Drill System. Our product range also comprises of Down The Hole Hammer, DTH Button Bits and Tricone Bits. We are successful manufactures and suppliers of Core Drill System that is known for its quality and durability. It has the core drilling supplies to maximize the drilling efficiency. The product offers all of the things that a drilling contractor need to successfully complete drilling and grouting all sizes of projects. Also we assure our quality check that is special done before dispatching the product to test the functioning of the product. Welcome! Whether you are collecting a core sample for an oil sands project, an environmental drilling application or for geotechnical drilling,the core drilling supplies to maximize your drilling efficiency. Our product offering includes everything drilling contractors need to successfully complete drilling and grouting projects big or small. We are a supplier of quality new core drilling products ranging from concrete core drilling machines, diamond core drill bits, diamond segments, spare parts and other products commonly used within the industry. 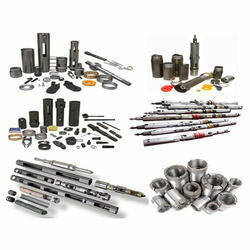 Looking for Core Drilling Tools ?